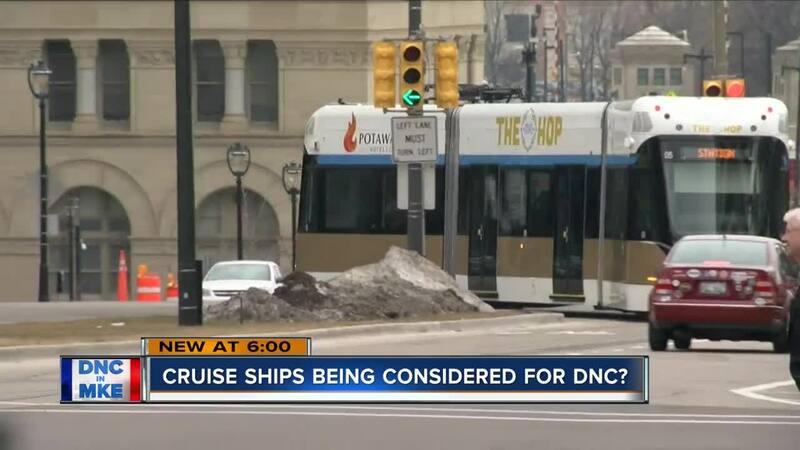 A cruise ship is just one of several creative options Milwaukee is exploring to house the 50-thousand people expected for next year's Democratic National Convention. Mayor Barrett has his hands full these days. The Mayor and DNC Chair Tom Perez are now on speed dial with each other. "In the week before the announcement he was essentially calling me every night with more detailed questions," Barrett said. "A lot had to do with venues and a lot had to do with transportation." Barrett's to do list includes venues to hold meetings, rallies and up 1,500 events in addition to the four day convention at Fiserv Forum. "You'll see all the restaurants along here in the Third Ward...they're going to be very, very busy," Barrett said. The streetcar was part of the appeal to the DNC. The Mayor wants to expand the line closer to Fiserv Forum and find a sponsor to give free rides. The Mayor says it's not just about extending the line - it's also about adding more streetcars. Keep in mind they cost about $5 million per car. "So that's not something where you just go buy it off the rack...it's a big decision to make," Barrett said. Barrett did say they have explored options to borrow a car from another city or company. The mayor's wish list includes exploring creative options - like bringing in a cruise ship for convention visitors, not delegates. Part of the challenge there is cruise ships are booked or contracted two years out. "We haven't come close to reaching a decision on that," Barrett said. "But that's an area where, again, there has been a lot of creative thinking as to ok would this be something that would work...If you know someone who has a cruise ship, they should contact our port." A lot to do in 16 months with hopes of a good review when it's all over. "I want people to say 'wow, Milwaukee is a great host city, it shines,'" Barrett said. "And then the day after that maybe we will try to get the Republican convention for 2024 because I'm a bi-partisan guy in making sure we have this for our community."